Most of my games these days are two players. I get the occasional 3+ game in, but it’s just a fact of my busy life that it’s easy to set up games with 2. Most of the time this is with my girlfriend, Knerd. We get pretty competitive. Weyland can be so frustrating! I’ll be mentioning tension a lot in these posts. Tension isn’t the be-all end-all of board games, but it is a big part of board gaming, and of games and entertainment in general. Tension is what makes turning a corner in an FPS exciting, what makes it shocking when there’s a big reveal on TV, and what makes choosing between multiple options so rewarding in board games. Tension can be created in multiple ways, but it usually comes down to a lack of information – not knowing how a decision will turn out, whether it is due to the addition of random chance, of decisions your opponent(s) have yet to make, or to an overwhelming amount of options too high to analyze. A decision where you know the outcome before you make the play may be satisfying, but it won’t be exciting in the same way . Every aspect of a board game impacts the creation and maintenance of tension during play. From the art on the box, to the fiddly rules edge cases, to the implementation of mechanics, it all comes together to create tension. The knife’s edge where your opponent has the potential to bring your carefully constructed house of cards, your painstakingly planned ambush, collapsing around you, if they could only figure out the right move. Or the tension where you have just had that same opportunity – did you make the right choice to diffuse their threat? Was it a bluff? Was your counter-stroke just not strong enough? That excitement, and the design decisions behind it’s creation, is what I want to talk about here. 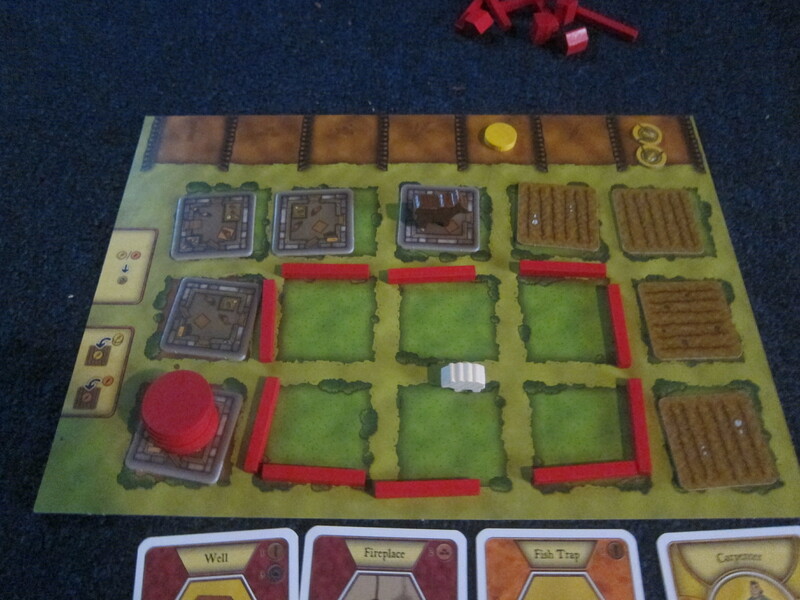 I like to describe Agricola to newcomers as a game about farming where you try your hardest not to starve. It an unforgiving game at times, and has a little bit of a steep learning curve at first. But Agricola is also widely considered one the best board games around, and definitely one of the best eurogames (although some say Caverna has altogether replaced it). Agricola has a lot going for it, definitely: relatively simple mechanics (for how deep it is), high-quality pieces, high supported player count, tons of replayability, and at 4 1/2 pounds, it just feels good to pick up. All that is just icing though – the reason Agricola has hovered around the Top 10 of so many people’s favorites lists is its tension. Tension in Agricola is omnipresent, and comes from several different angles. Agricola’s primary source of tension is its central mechanic: Worker Placement. Worker Placement involves using markers to select actions you want to take in a game, thereby usually denying others’ the option of that action, or at least imparting some detriment if they take it as well. The big circles are Workers, selecting actions. The little circles are resources that have built up over the course of the game. Agricola plays with this mechanic in several ways to generate tension. The first is that it straight-up denies your opponent(s) that option. If you take a resource that turn, no one else gets to take that resource, which is great if you’re the first to take the action space that turn, but not so much if someone else grabs it. So you’re always pressured to take an action space right away if it’s at all useful to you, before someone else takes it. And then there’s the opposite: opting for an action because you know it’s useful for someone else. Hate-selection like this is always surprisingly delicious in a game like Agricola, which doesn’t see much direct player interaction. The second reason worker placement in Agricola works so well as tension generation is many of its actions stockpile resources if they are not selected during a round. Round 3 might see one action space giving 3 Wood, and if no one selects that action, during Round 4 it will give 6 Wood, Round 5 it will give 9, etc. Every round the action is not selected, it gets more and more tantalizing to select it. Can you afford to wait for the “Take Sheep” spot to build up, freeing up your worker to build that Fireplace your family has wanted for so long, or will someone else swoop in and take them if you don’t? That brings us to another way Agricola plays with worker placement: The build up of resources and limited workers per player puts action economy at a premium. You must balance the opposing pressures to take a space before someone else denies it by taking it themselves and saving actions by allowing a resource to accumulate on an action space and taking them all with one action once they’ve built up. It’s a tough choice during the game, which is why it’s such a great source of tension! Agricola’s scoring also generates a lot of the tension in the game. If you’re unfamiliar with it, it basically demands your farm have a bit of everything (vegetables, grain, pigs, fields, etc) while at the same time never allowing you the time or actions to do it. You score maximum points by being a generalist, but the way the worker placement mechanic works out is you almost always end up being a specialist in some form. This grinds a lot of people the wrong way – it can feel unfair to be punished for not growing carrots when you have the best sheep farm in the country. But it also adds a large amount of tension and weight to the choices you make during the game. Pictured: Not the best sheep farm. Information can also be a source of tension. 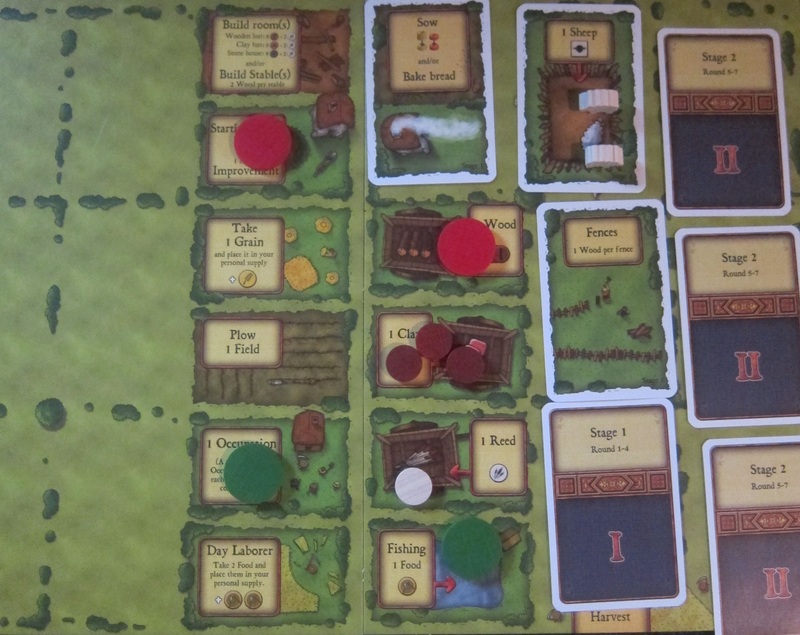 Agricola is very nearly a game of perfect information – you can always see everyone’s farms, how many workers they have to place, what actions they have already selected that turn, and what improvements to their farm they have already made. One thing you can’t see though, is the possible Minor Improvements they can make to their farms. These cards, as well as Occupation cards, are dealt to each player face down at the beginning of the game, and only they can look at them. Once they are played (which takes an action and usually some resources), they are put face up near that person’s farm so everyone can see them. But you can never be sure what someone is holding back or building up to, and that does contribute a little to the tension in Agricola. 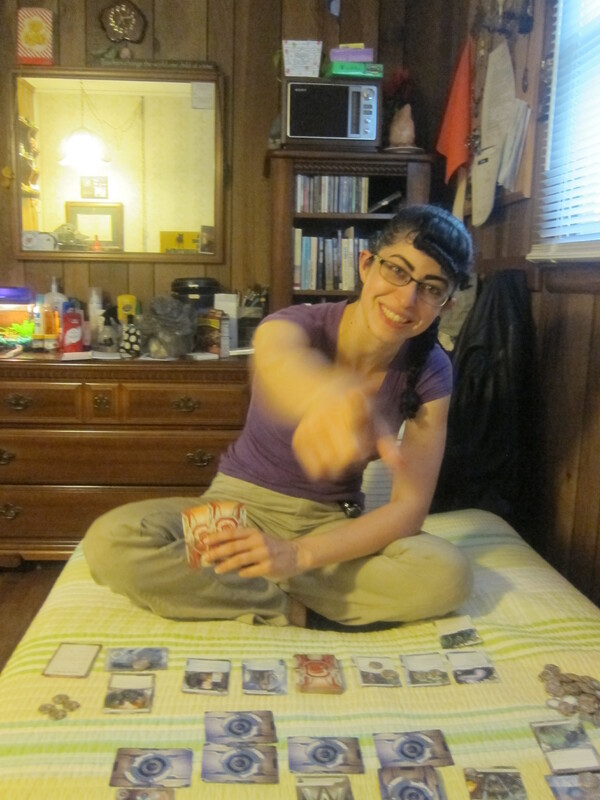 The last source of tension I’m going to discuss is one of the most contentious parts of Agricola – Begging cards. 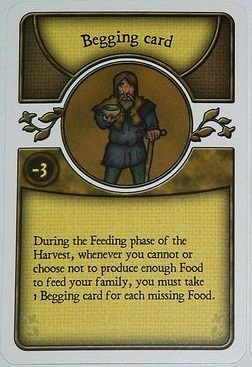 You take a begging card in Agricola whenever you don’t have enough food to feed your family during Harvest Time. Begging cards give you -3 points at the end of the game, and it can be very difficult to come back from that. Moreover, it can be hard for new players to avoid taking Begging cards! But putting so much emphasis on keeping your family fed is not only thematically appropriate but fantastic tension generation! It makes every decision so important – can you afford to take the time to dig a well, or build that beautiful stone path, or upgrade to the luxury of a clay house, if it means you might not be able to feed your family? Ultimately, Agricola is a game of very difficult decisions that heavily impact the direction your farm will take. It can be stressful, and unforgiving, but it is also supremely satisfying. It’s almost as though you’re not only playing against your opponents, but also the game itself. If you haven’t yet played it, I highly recommend it.